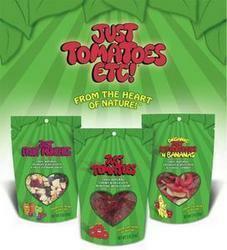 Just Tomatoes Freeze Dried Fruit and Vegetables - DISCOUNTED! Dried fruits and veggies - no preservatives - just the real thing! More than Just Tomatoes! All human-grade veggies and fruits. Can be served dry or reconsistituted with water. Simply that - JUST Bananas. No preservatives. Nothing added. Simply that - JUST Blueberries. No preservatives. Nothing added. Simply that - JUST a combination of apples, raisins, sour cherries, blueberries, mango, pineapple and raspberries. No preservatives. Nothing added. Simply that - JUST Pear, Apple, Peach, Banana, Strawberry and Red Grapes . No preservatives. Nothing added. Simply that - JUST Peas. No preservatives. Nothing added. Simply that - JUST Just Pomegranate arils (seeds). No preservatives. Nothing added. Pomegranates are high in Vitamin C, calcium and potassium and are a great source of fiber and antioxidants. Simply that - JUST Raspberries. No preservatives. Nothing added. Simply that - JUST Raspberries. No preservatives. Nothing added. ! Simply that - JUST Strawberries. No preservatives. Nothing added. Everyone's favorite berry � with crunch! Nothing beats the taste of sweet strawberries. Strawberries are packed with great nutrition as well as great taste! Simply that - JUST Strawberries and Bananas. No preservatives. Nothing added. Simply that - JUST Veggies. No preservatives. Nothing added. Corn, Peas, Carrots and Jalepeno Peppers. Simply that - JUST Veggies. No preservatives. Nothing added. Corn, Peas and Carrots.